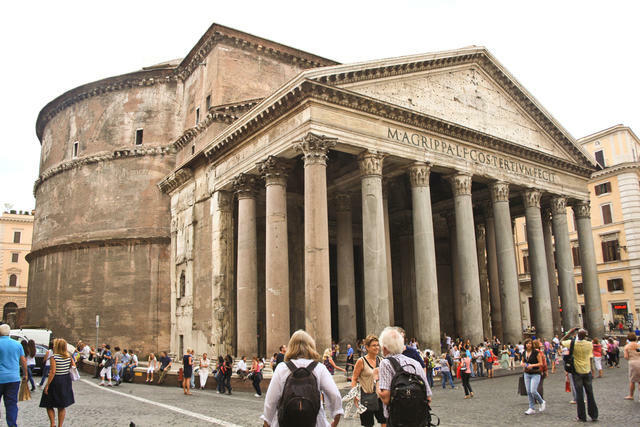 The Pantheon is thought of as one of the most remarkable structures to have been erected in Ancient Rome. The simple look to the building doesn't do the architectural complexity of the building justice. The Pantheon was a temple to all of the Olympian Gods. It originally was up on a platform with stairs leading to the entrance as was typical of other Roman temples. Today though, as seen in the photo above, the street level has risen to hide this. The inside walls that support and buttress the dome are all disguised, as the Romans loved to do,by two tiers of lavish architectural detail and beautiful marble. More than half of the orginal Ancient Roman decor still survives to this day.